The last piece of the insulation jigsaw went in today: 27 bags of Warmcel recycled newspaper-based insulation, blown into the floor of the new master bedroom. This room sits above the unheated stable and tack room, now our garage and plant room, so when we used this room as our living room, it was perennially freezing unless we had storage heater, radiator and the log burner on, full blast. With the heat pump now in the plant room, we also needed better sound insulation between the floors – the pump isn’t particularly noisy but the buzzing of the compressor would definitely not aid a good night’s sleep. Insulate from below with more of the sheet Kingspan we’ve used for the walls, meaning we’d have to put in another layer of garage ceiling. Insulate in the 260mm floor void with hard or roll insulation. That would have meant either lifting the original floor boards or removing the entire double-sheeted garage ceiling. A blown insulation which we could hopefully get right across the room from the board we’d already lifted to install the smart radiator. Having made the choice, the ‘How’ came down to either Perlite granules or Warmcel. The first was easier to source and marginally cheaper for materials alone but, on a DIY basis, it wasn’t clear how easy it would be to shovel into each bay in the floor. Once we found a Warmcel supplier in Scotland – not easy and, unlike in the USA, you can’t just buy the Warmcel and hire the blower for a weekend (although we did consider repurposing our garden blower) – we managed to get an inclusive quote for £600 (exc. VAT), about double the material cost alone, which seemed fine, especially given where we live. The guys from Sustainable Energy Scotland turned up when they said they would, were cheerful and helpful, did the job neatly and without fuss, cleaned up after themselves and left. If you haven’t carried out a major building project, you really wouldn’t believe how rare that is. 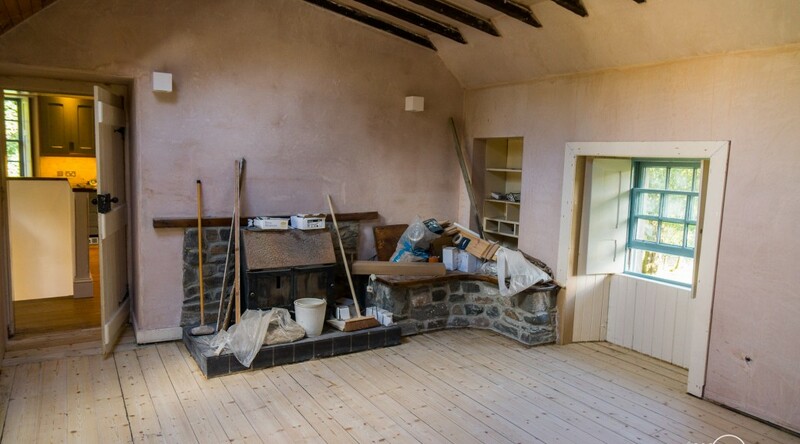 We’d calculated a need for about 24 bags of Warmcel – with a little allowance for settling, we ended up using 27 bags, filling every mm of the floor void. That means a load on the ceiling below of about 216kg over about 26m2 and a final u-value around 0.125. Had we used Perlite, we’d have paid more than twice as much and the insulation would have weighed over 1 tonne. Combined with the wall (90mm K7/Superquilt), 400mm of roof insulation and the new window shutters, that room has now gone from only just staying warm with a log-burning stove, a storage heater and a central heating radiator, to being toasty warm with a single Dimplex Smart Rad running off the heat pump. And we got £500 back from the Green Deal Cashback scheme to boot. I’d call that a result. Previous PostPass the Anthracite…Next PostThere. Or thereabouts.